Jet Ski rentals are by the hour, no extra charge for sharing the ride. When booking Waverunners you are NOT booking a time slot, You are simply purchasing a ticket, just bring your ticket to our front desk and we will get you on the next available waverunner. Wait times usually are not too long, if any at all. 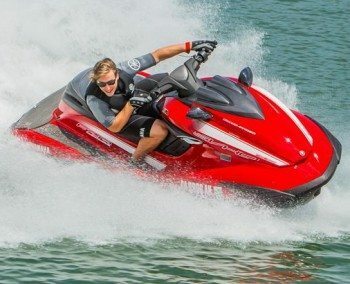 We have an all new fleet of Yamaha VX1100 WaveRunners for you to enjoy. 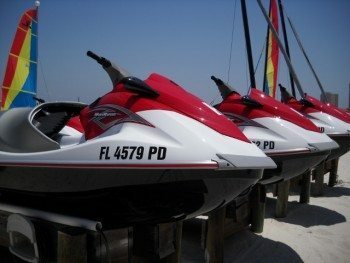 Our jet ski rentals on Pensacola Beach are the big Yamaha VX’s that can seat up to three people and there is no charge for passengers or changing drivers. The top speed is around 50-55mph. They rent for $55 for a half-hour, $85 for the Hour, $190 for two hours, and $325 for four hours, and the full day (8hrs) for $550. Fuel is included along with all the required safety equipment. No reservation is required. Those wishing to drive that were born Jan 1 1988 or after are required to have passed a boaters safety course. We offer the state of Florida test here at our shop for $3.00. You can also take the course on-line at Boater Safety Course for free. Just print out the certificate of completion and bring in with you along with a photo identification. All drivers must sign and initial the Rental Agreement before renting. Download Key Sailing Rental Agreement and review, to save time at the check-in counter print out the agreement and have it filled out when you arrive. When booking Waverunners you are NOT booking a time slot, You are simply purchasing a ticket, bring your ticket to our front desk and we will get you on the next available waverunner. Wait times usually are not too long, if any at all. We ask that you please be flexible with your times. Choose a date below and then the number of waverunners. Any questions call us at (877) 932-7272.